Diani: Best Beach in the World? We just got back from a long weekend in Diani, a gem on the Kenyan coast with a reputation as one of the best beaches in the world. It did not disappoint - from its fine white sands to the warm, clear turquoise waters of the Indian Ocean. Even though it's currently peak season, we didn't even find the beach crowded, either! 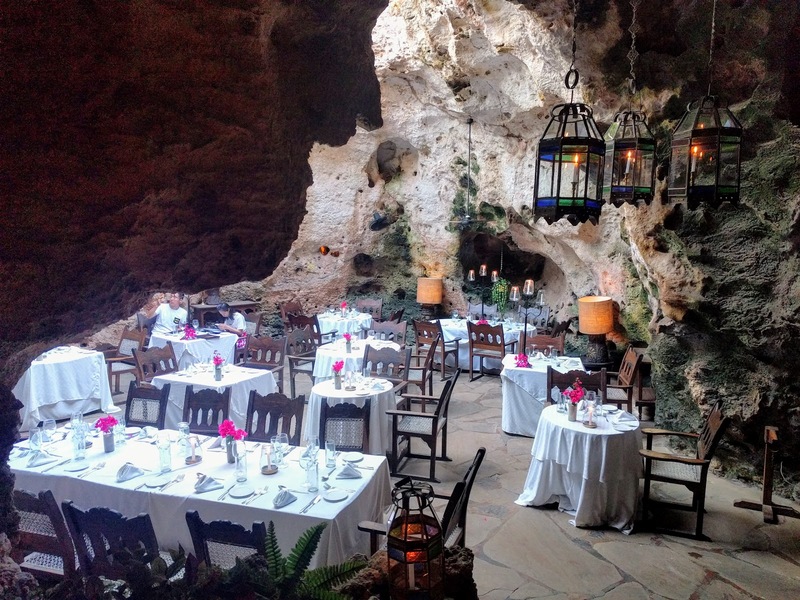 When we arrived at our resort, we were informed it was a special night and that dinner would be served on the beach instead of in the usual restaurant. 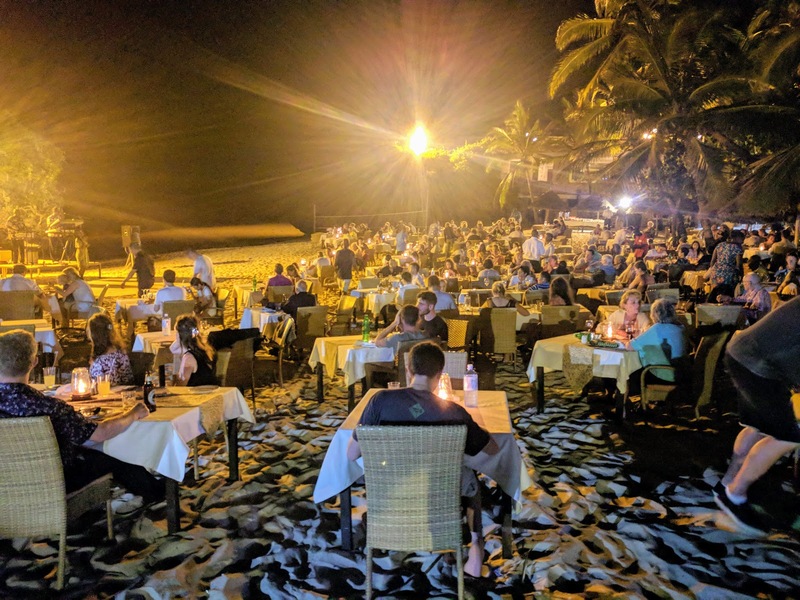 The hotel staff moved a massive number of tables, chairs, and settings out onto the sand in view of the waves, set up a stage, and most importantly of all brought a vast selection of food out to a temporary buffet. So we enjoyed live music while eating dinner on the beach - not a bad start to our romantic weekend getaway at all. Our first full day was spent snorkeling with a company recommended to us: Pilli Pipa. 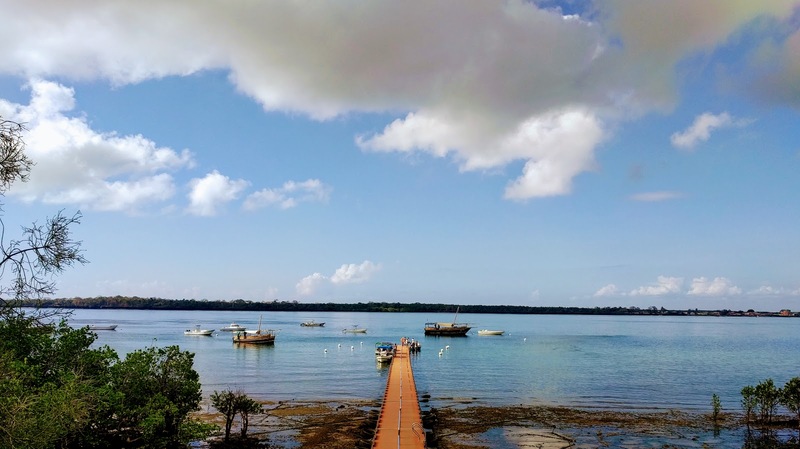 We went out to Wasini Island, which was quite a distance away - about an hour and a half by car and then another hour by boat. Although they didn't guarantee we'd see wild dolphins, we were told it was a possibility and weather conditions looked good for sightings. 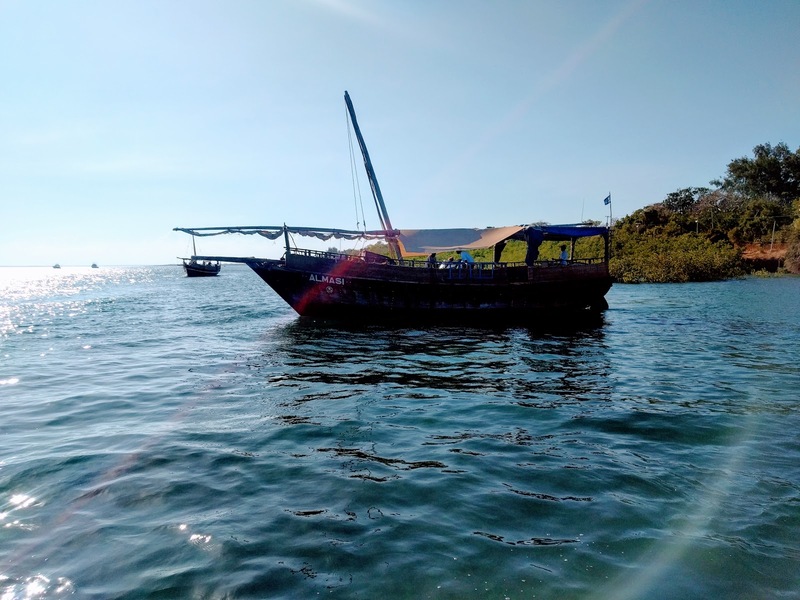 Our boat, named "ALMASI" (the Kiswahili word for diamond) seemed to bode good luck for rare and precious finds from the beginning. The excursion ended up being well worth it: we saw two wild dolphins (unfortunately so briefly I couldn't get a photo in time) from the surface and then an array of exciting things while snorkeling: a huge sea turtle swimming right between M and me, two octopuses, a Moray eel, and so much more. We were so glad we had decided to go. It was very cool to arrive at the restaurant at 6pm and watch it transform as the sun set and the stars began to appear. I would recommend trying to go on a clear night, as the view of the night sky is, well, stellar. You can see the difference in the photos of the same space above during the daytime and below at night. 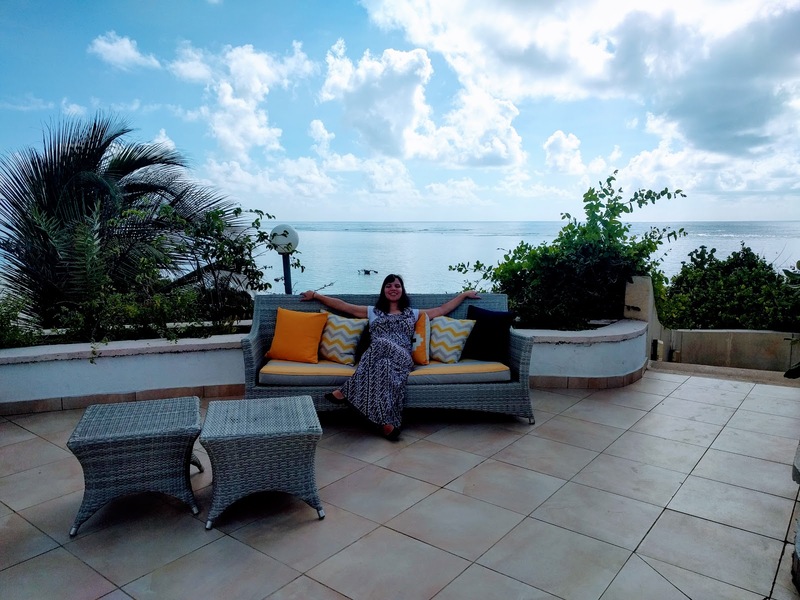 We had a lovely time and would recommend Diani to any beach-lover out there. That being said, this trip also captured a special and bittersweet kind of Foreign Service experience that's familiar to almost all expats. You see, at the exact same time we were having our once-in-a-lifetime vacation on the Kenyan coast, some of my best friends were gathering in my college town for a reunion that I had neither the annual leave nor the funds to join. Thankfully, I was able to video call in for a few short minutes - just long enough to see the faces of people I dearly missed. These are friends with whom I've shared everything from philosophical debates over whiskey to all-nighters to camping trips to our highest highs and our lowest lows. No matter how exciting this expat life can be, I've found it hasn't really replaced home or the relationships with the people you love. To be honest, I hope it never does. "I'm Not Like Other Americans"
There's a meme that's been around for a while called "I'm not like other girls." 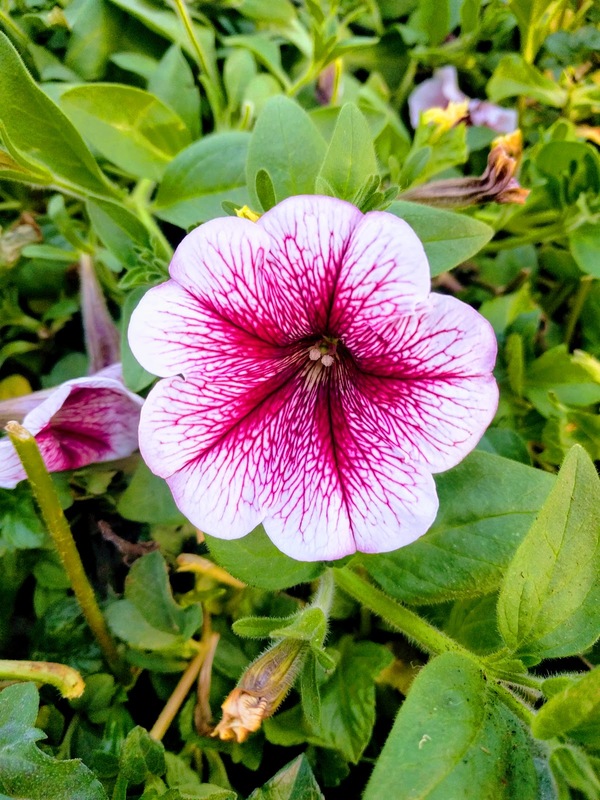 It goes like this: some female on the Internet claims, "I'm not like other girls" because she doesn't wear makeup or doesn't like heels or does stereotypically masculine things or however she chooses to identify and describe herself and her interests. All of those preferences regarding how she chooses to dress or spend her time are, on the whole, completely fine. What makes this trope annoying enough for it to have become a meme is that "I'm not like other girls" is almost always presented in a way that implies the subject is better than or preferable to "other girls" for being different. This great satirical piece in The New Yorker nails it. Of course, there are American expats like that. I would place money on the fact that there are expats from pretty much every country in the world like that. There are also incredibly kind, thoughtful, culturally engaged Americans almost everywhere, as well. What irks me most about this mentality is the fact that cultural understanding and exchange should be a two-way street. I do agree that we should do as the Romans do as much as possible when in Rome, but at the same time I always try to be charitable to immigrants or tourists or anyone coming to the United States who hates our food or gets really frustrated with the way we do things or just wants a break from speaking English once in a while. 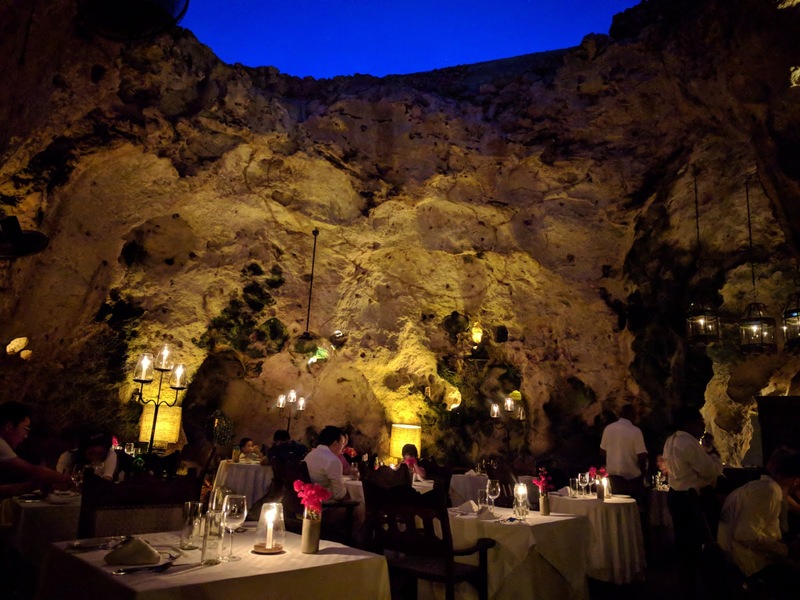 I think we should be afforded the same generosity as much as possible when traveling and especially when living abroad - because, let's face it: sometimes being an expat is really tough. There are jerks out there, but a lot of Americans are just trying and kind of stumbling their way through adjusting to a new culture and lifestyle, as are travelers everywhere! At the end of the day, I'm fairly certain anyone can think of something kinder to say than "I'm not like other Americans", anyway. 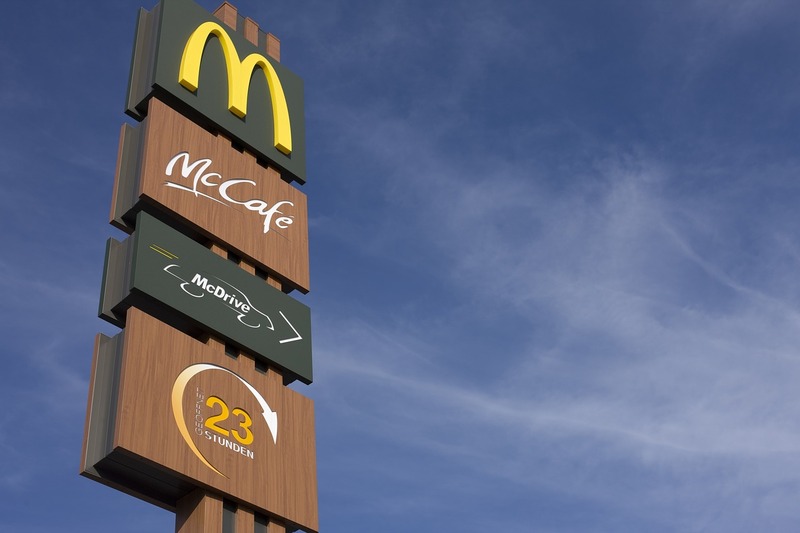 This is the last and shortest post in a three-part series on our trip to Dubai. (You can read the first here and the second here.) 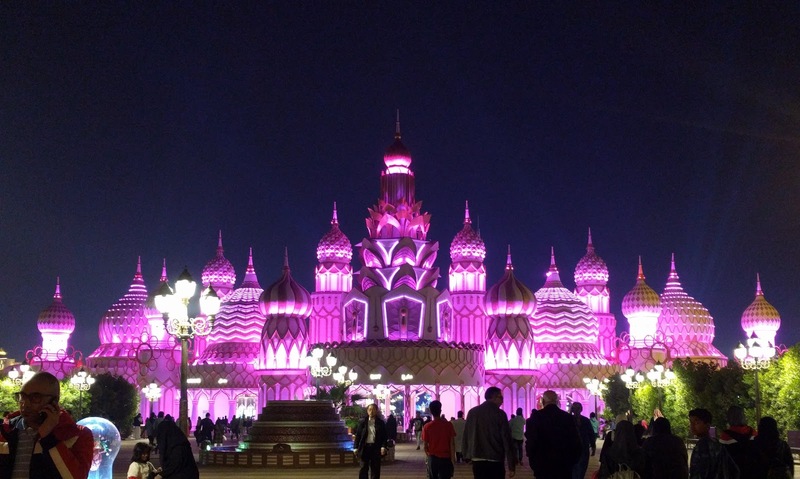 This entry focuses on one of the last attractions we visited: the Global Village. Our friends were not the biggest fans, but we loved it. It's very inexpensive to enter the Global Village, but a lot of things inside cost money: the food, the souvenirs, the drinks, etc. Many countries had their own sections of the village, while others were lumped together into categories. For example, each of the Arab Gulf countries had their own section, but the entire continent of Africa was crammed together (as were both of the Americas). My favorite part was the sharing of traditional or cultural crafts of some kind (or music or art), often by people from that culture wearing traditional dress. 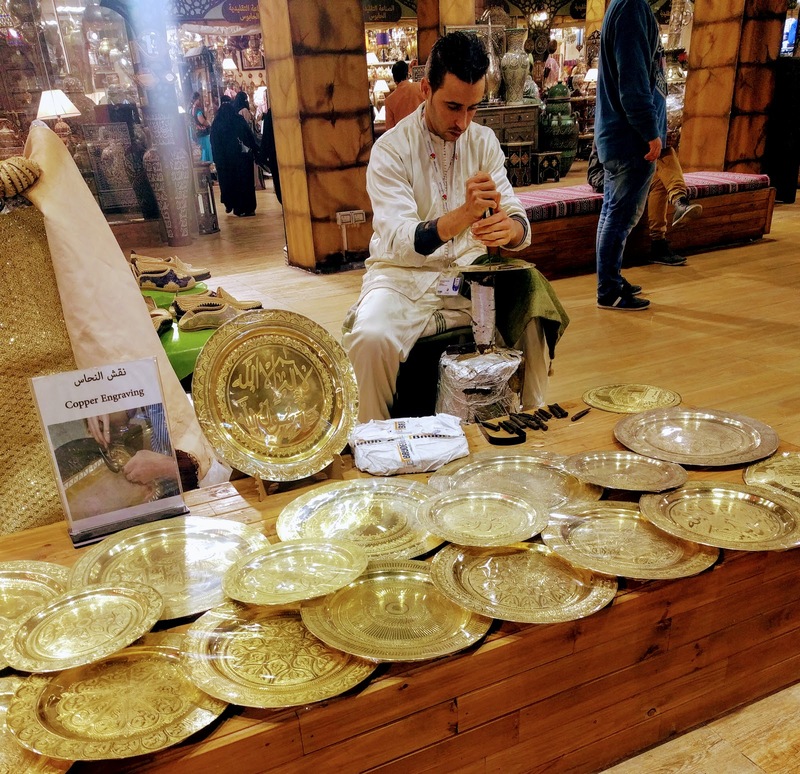 A man beautifully engraves plates, often with Islamic art or Arabic calligraphy, in the photo above. Below, a man weaves a traditional basket. There was so much to see in the Global Village that, to be honest, it was a little overwhelming. It's one of the reasons we didn't get nearly as many photos there. 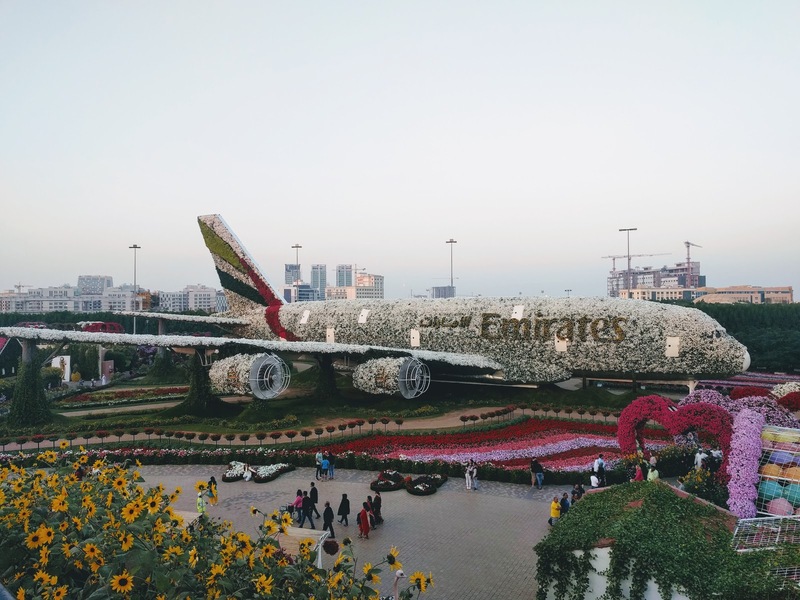 We later learned that Dubai tears the whole thing down every year and completely remakes the displays for each country or region to keep things new and interesting for visitors. It even gets the locals to keep going! 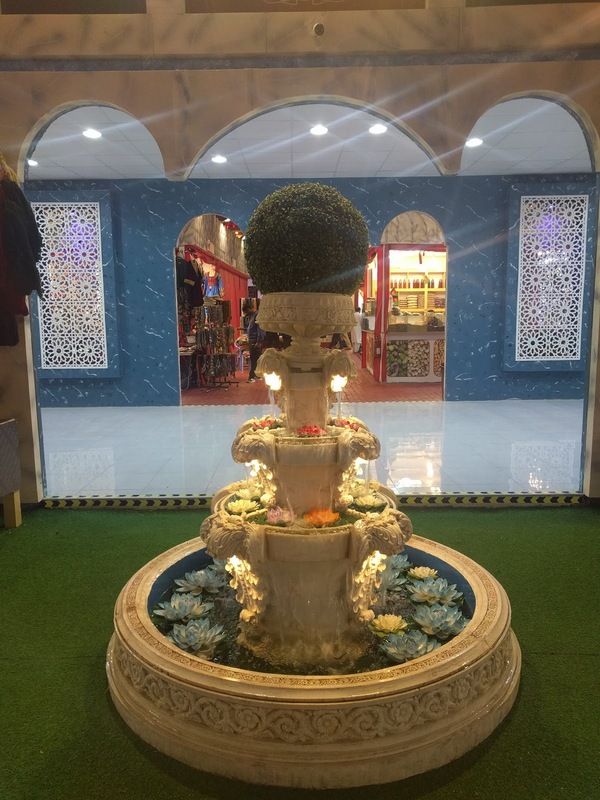 At the end of the day, we recommend the Global Village at least as a way to get a fairly authentic taste of quite a few places around the world, despite its shortcomings. (For example, even though all of Africa was regrettably lumped together, once we walked inside we found the exact kinds of distinctive paintings and crafts that you would find in any Kenyan market. We were really surprised!) We only spent a few hours there, but a full evening (including dinner and one of the many free shows) would have been even better. 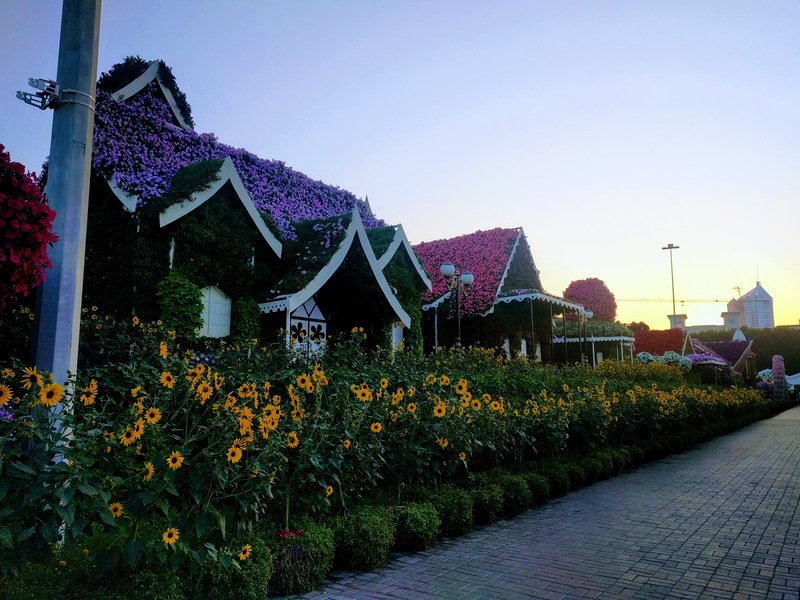 Houses Made of Flowers... in Dubai?! 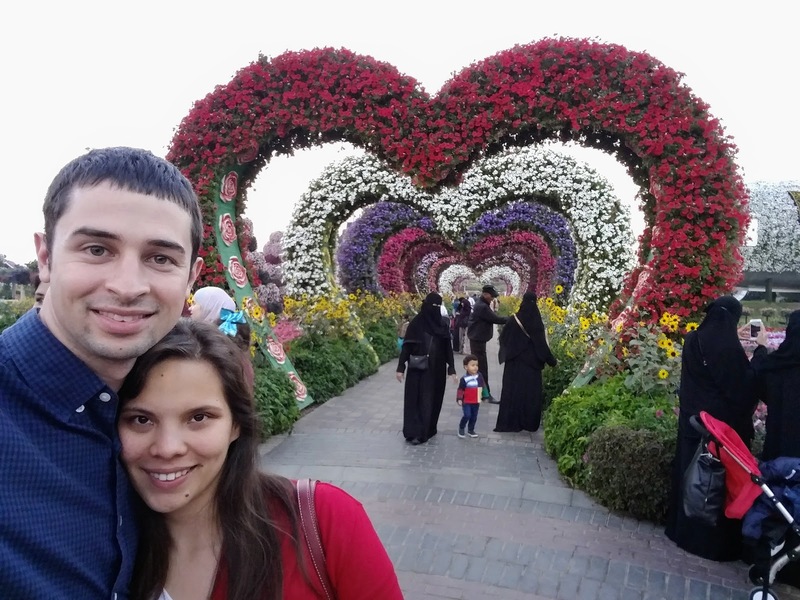 This is the second in a three-part series of posts on our trip to Dubai. (You can read the first here, and the third here.) 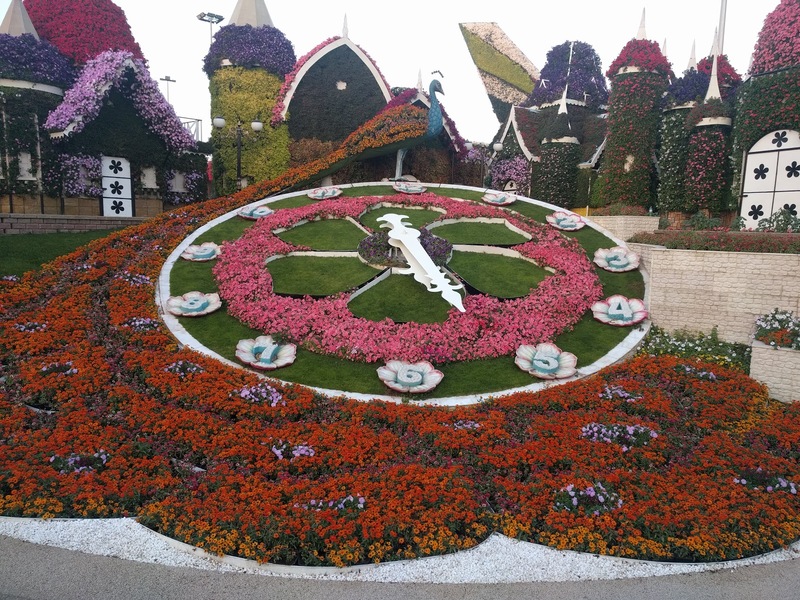 I'm so glad we made time to enjoy the Miracle Garden... it definitely lived up to its "miraculous" reputation. 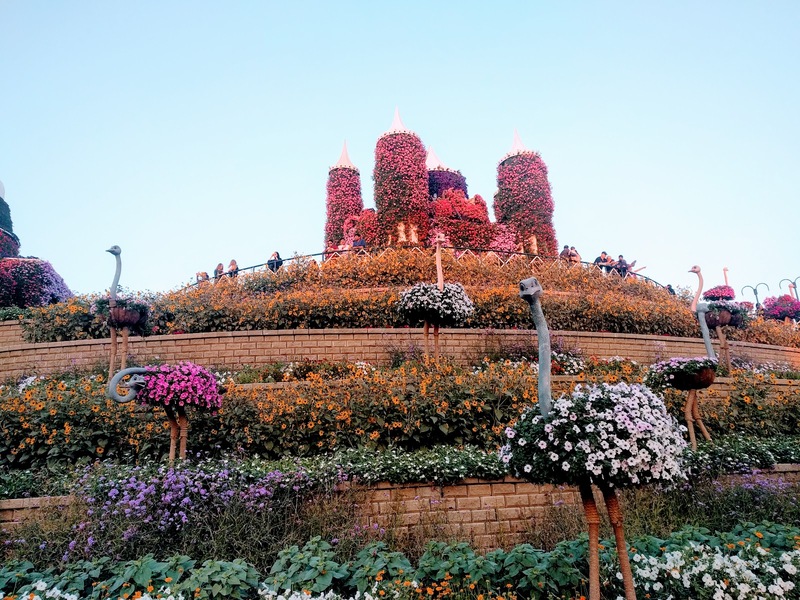 Just look at those life-size houses made of flowers above and the beautiful close-up below! In case you were tempted to forget that you were in the Gulf because of the large number of Western and Asian tourists, women in abayas turned out in droves as sunset approached. 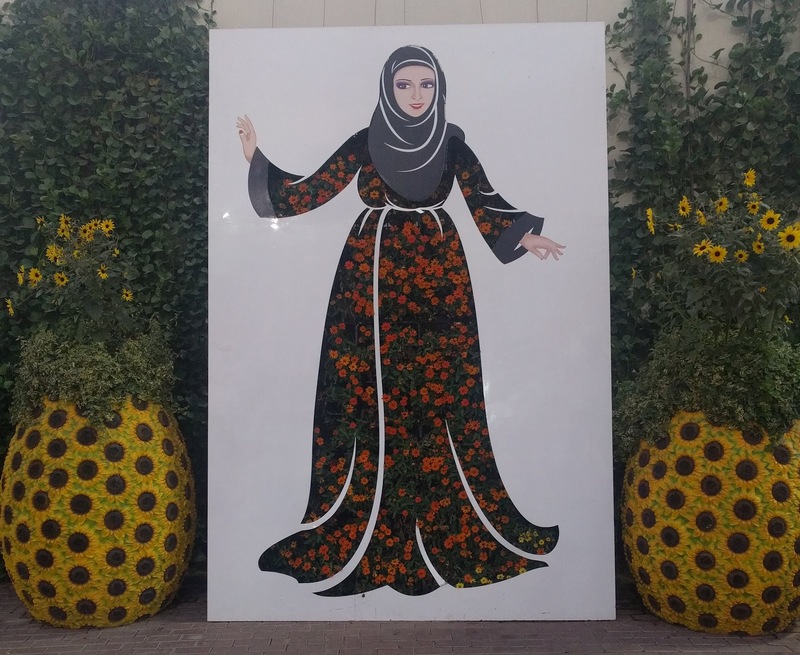 There were also a few cute art installations of modestly dressed Muslim women with flowers for dresses. It was such a simple but cool idea. My single favorite installation was this beautiful arrangement of flowers positioned to look like a giant woman's hair. It took my breath away when I first noticed it. M's favorite was this literally life-sized airplane display made out of flowers. Even the characters spelling out "Emirates" were done so perfectly, and the propellor blades were actually spinning! There were definitely a few quirky touches to the gardens, as well. For example, the grounds were peppered with these strange stone ostriches with their necks arranged like bendy straws. 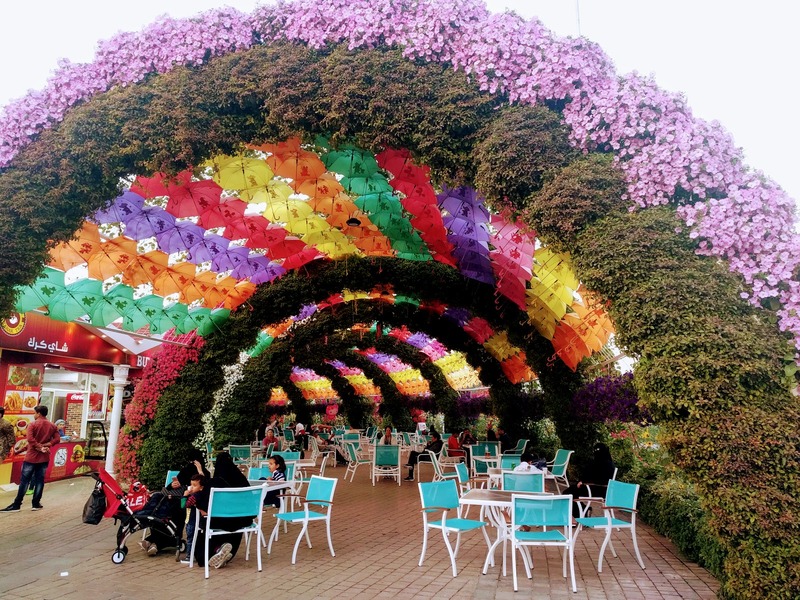 We ended our Miracle Garden visit with a tropical fruit drink at one of the many cute cafes lined up under awnings made of flowers and colorful umbrellas. (I wish we had had stomach space for some delicious Arabic fare we saw on offer: even kanafeh, one of M's favorite foods! Maybe next time.) 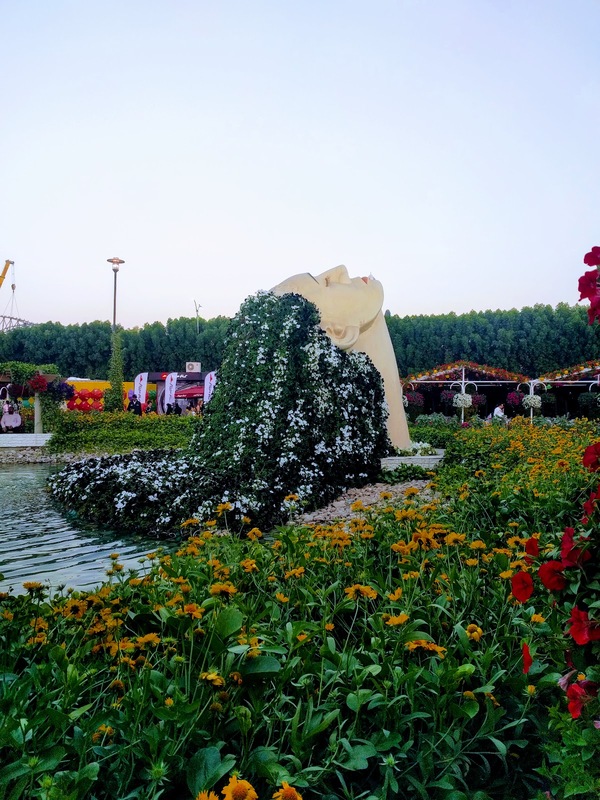 Regardless, we would highly recommend this attraction to anyone in Dubai - especially nature lovers!